Q. How do I authenticate the EBSCO Databases app? The EBSCOhost app asks for an authorization key to use the app. 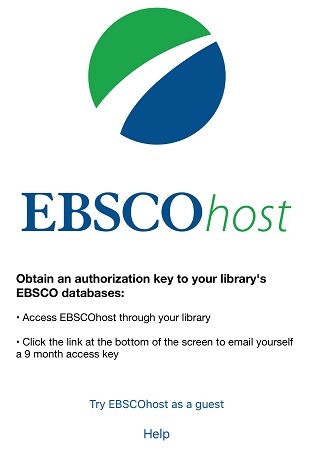 When you first install the EBSCOhost app, you will see a message on its opening screen that says you need an authorization key to use the app. Follow the instructions on the screen to obtain a key. Click on any EBSCO database. Authenticate with your library card if you are not at the library. It will ask to open the link in the EBSCOhost app, so click Open. You should now have access to EBSCOhost databases within the app. The authentication key request is active for 24 hours when you have it sent to your email. If it has expired, you will need to request another key. The authentication key will expire after 9 months. When it does, you will need to request another key. The authentication key link sent via email must be clicked on the device you wish to authenticate. If you wish to search only specific databases, you can go to the Settings section of the app and choose which databases are searched. If you have clicked "Try EBSCOhost as a guest" in the app, when you authenticate, all databases will be turned off by default. You can turn them back on under Settings.